Massachusetts - also called the Commonwealth of Massachusetts is a state in New England sharing the coastline of the Atlantic Ocean. It is one of the smallest states in the country, but it is also one of the most densely populated one. This is one of the most important states in American history. Massachusetts is a home to the oldest and one of the most prestigious universities in the US - Harvard University (founded in 1636). Another although this time rather “infamous” place associated with Massachusetts is Salem, well-known for its witch trials in the early 1600s. The history of Massachusetts and its largest city Boston is deeply rooted in the history of US. This was the center of the movement of independence from Great Britain. The statement: “It all started here” is not an exaggeration! So if you want to share the pleasure of nature, beauty of Atlantic shore and history of the United States, Massachusetts is the place to visit! 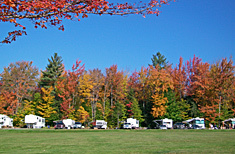 At Country Air Campground there are pull-through RV sites with full hookups and peaceful wooded tent sites as well. There is a lot to do here while you are traveling and taking a rest: if you like nature there are hiking and biking trails nearby. There are other outdoor activities that you can enjoy here, such as hunting, fishing, canoeing and more. Some other water sports that you can try at Country Air Campground are rafting and tubing on the nearby Deerfield River. The park is located in a convenient area with stores, golf courses, service garages, recreational vehicle sales and services, churches, hospitals and medical centers. Beach Rose RV Park is open for trailers, motor homes, pop-ups and tents. And there is a plethora of opportunities for fun here: there are miles of sandy beaches, nearby state parks like Plum Island State Park, Salisbury State Park, Odiorne State Park and other beautiful areas where you can “meet” unspoiled nature. If you enjoy sports, then you will find here occasion to do some surf casting, kayaking, surfing, cycling, boat mooring and so on. Whale watching, deep sea fishing and clamming are also possible in the area. The park itself is cozy and small with only 50 sites. There are full hook-ups including water, sewer and electricity), paved roads and modern restrooms. The free Wi-Fi is available on the site for guests. The Wagon Wheel campground is located right in the middle of nature. There are grassy and wooded sites, several secluded tent sites and pull through sites for RVs with full hookup service. Pets are welcomed but attention - horses are allowed too! The park has bathhouses with coin operated showers, laundry, recreational hall, swimming pool, fun game room and fishing pond (n license is required to fish in the pond). There is also a dump station for RVs. Propane, wood and ice is available on the premises. The local store at the camp offers a lot of useful things for visitors, while the new bar offers snacks. Those looking for exercise will find here sports grounds such as volleyball court, basketball court, horseshoes pit and more. Located close to Cape Cod, this place is truly beautiful in any season. The camp is all age friendly, with WiFi access, full hookups, on site store and BBQ places. There are activities for all ages, such as shuffleboard, mini golf, basketball, billiard, poker, bingo and more. Musical events are organized regularly, and surprise-surprise: there is a library for resort’s guests. You can check out the calendar with all the upcoming events in the web page of Carefree RV Resort. Worth to mention – Kennedy Museum, Cape Cod National Seashore, Cape Cod League Baseball, Martha's Vineyard and Provincetown are all close by. The best features of the park are the spacious campsites with full hookups. Resort operates all year round offering summer & winter seasonal sites as well as tent sites. The park offers just as much comfort as you would need in the wilderness: clean restrooms & showers, a store, a laundromat, dumping station and a recreation hall. During the summer time you can enjoy the swimming pool and the spa. Peppermint Park Camping Resort is great for kids, they have a playground, softball field, horseshoes pit, but also basketball and volleyball grounds. There are plenty of planned activities & entertainment all year long. Visit Mohawk Trail and find a campground close to other attractions of the area. A directory of campgrounds: tent and RV camping parks Massachusetts (MA) will give you some place to start looking for some nice campground for a pop up camper and a motorhome trailer. If you prefer a beach camp, find one that has lot sites for a motor home or any other type of recreational vehicle. Some campgrounds allow you to have a mobile home to sit year after year as a little get away during the year. 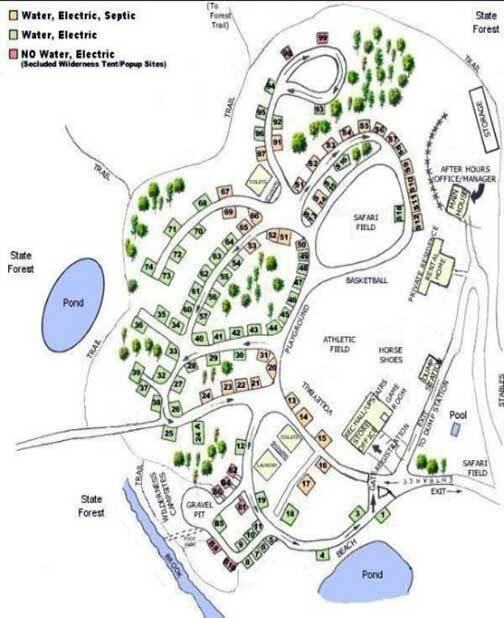 The directory of campgrounds: tent and RV camping parks Massachusetts (MA) offers a starting place when looking for a nice little campground. The attractions and other activities to do in Massachusetts will always be a good time when you find a nice campground to stay.